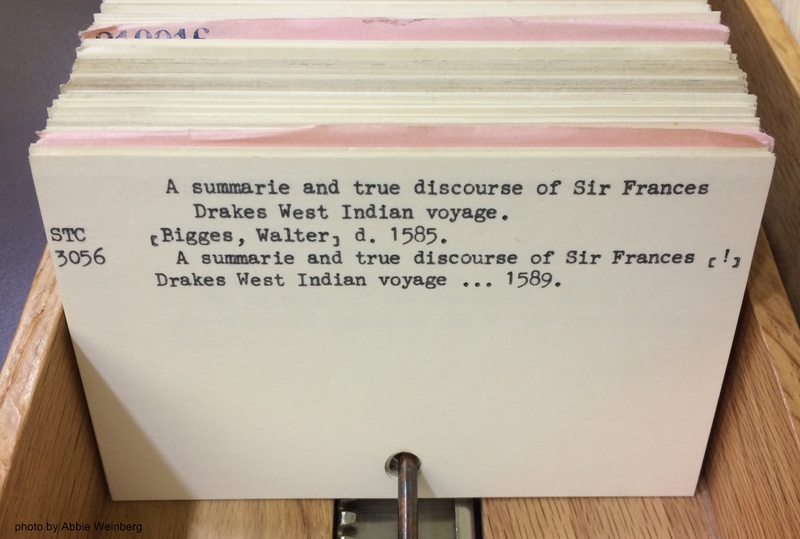 Whenever I am giving a tour of our Reading Rooms, or introducing a new Reader to our collection, I always make it a point to mention that we still have a card catalog room (two, in fact—one primarily for our printed collections, and one primarily for our manuscripts and art collections), which together hold forty separate series of cards. Left, the card catalog room primarily for the manuscript and art collections; right, the card catalog room primarily for the print collections. The responses I get to this fact are varied, ranging from “Oh thank goodness, I’m so much more comfortable using a card catalog!” to “A what?” (along with nearly every possible response in between). Many people are surprised we still have our card catalog, let alone the fact that it is easily accessible to our Readers, and that we encourage people to use it. So what IS a card catalog? For those who respond with “a what?” or blank looks when I mention the card catalog, I stop and try to explain both what it is and why it’s important. A card catalog is, simply, a set of index cards1 that record bibliographic information about the books in a collection—author, title, publisher/publication date, subject, and call number. These can be grouped together in a number of ways, often resulting in having multiple cards for the same book. 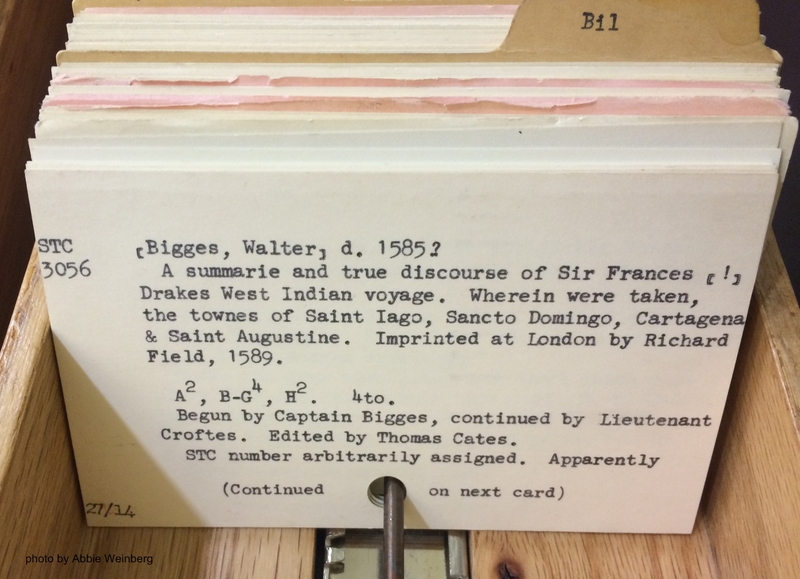 For example, cards for Walter Bigges’s A summarie and true discourse of Sir Frances Drakes West Indian voyage (STC 3056, also available in our online catalog) can be found in three different places in the main card file. Card for Bigges’s A summarie and true discourse of Sir Frances Drakes West Indian voyage under the author name. 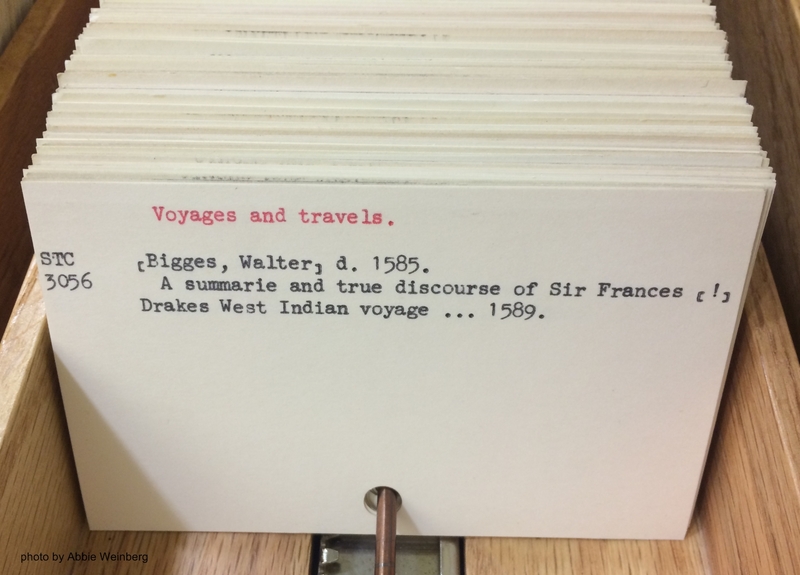 Card for Bigges’s A summarie and true discourse of Sir Frances Drakes West Indian voyage under the title. Card for Bigges’s A summarie and true discourse of Sir Frances Drakes West Indian voyage under the subject heading. Some libraries will have separate sections for cards filed by author name, by title, and by subject; others (like ours) will interfile those, so that you will see all three types contained in one drawer. 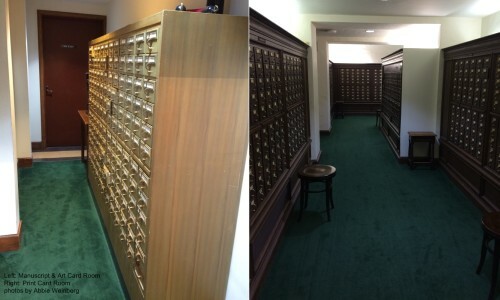 But why do you still have a card catalog? The short answer is, of course, a resounding NO. The longer answer takes into account factors such as institutional history, staff time, search methodologies, and physical space. For the Folger, our card catalog plays an important role in maintaining the rich history of our collection. Although we stopped adding cards for newly acquired items in the late 1990s, that leaves around 65 years of collection history encompassed in the narrow wooden drawers. 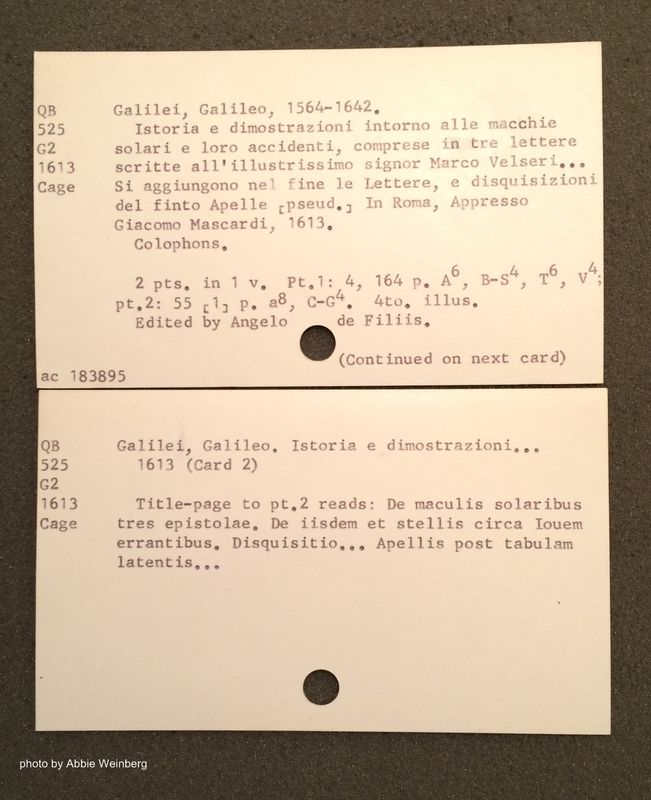 These cards sometimes contain hand-written annotations that can give important clues when trying to solve a mystery or document changes in the call number of an item. The Folger is best known for our collection of Shakespeare-related materials and early English printed books; historically, these two areas have gotten the bulk of attention when it has come to digitizing our catalog records. That still leaves important parts of our collection under-represented in Hamnet, such as the continental-published books, and some of the more ephemeral collections such as playbills and sheet music. While the intention is, of course, to get everything into the online catalog eventually, there are only so many hours in a day, and priorities had to be set somehow. Therefore, using a combination of Hamnet and the card catalog remains the only way to reliably discover all of the materials we have on a given topic. You won’t find this in Hamnet! 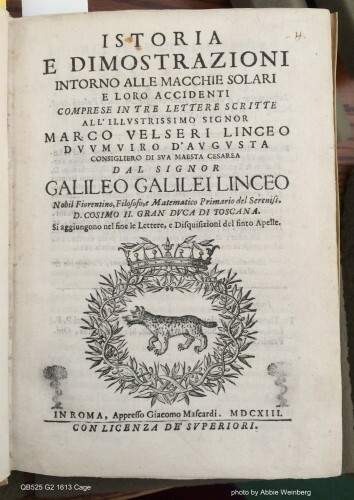 Title page of Galileo’s Istoria e Dimostrazioni Intorno Alle Macchie Solari e Loro Accidenti, 1613. Two days of Galileo’s observations of the sun. Without someone looking through the card catalog, this book might not have come to the attention of our staff. Finally, card catalogs provide an opportunity for serendipitous discovery that is difficult to duplicate in an online catalog. The physical act of searching through the cards requires a somewhat different thought process than searching an electronic catalog. Flipping through the cards on your way to what you think you’re looking for is a great way to find items you didn’t know you were looking for. Because the cards can be physically arranged in different ways, it is possible for us to provide many different access points into our collection. For example, we have both chronological files and publication location files. 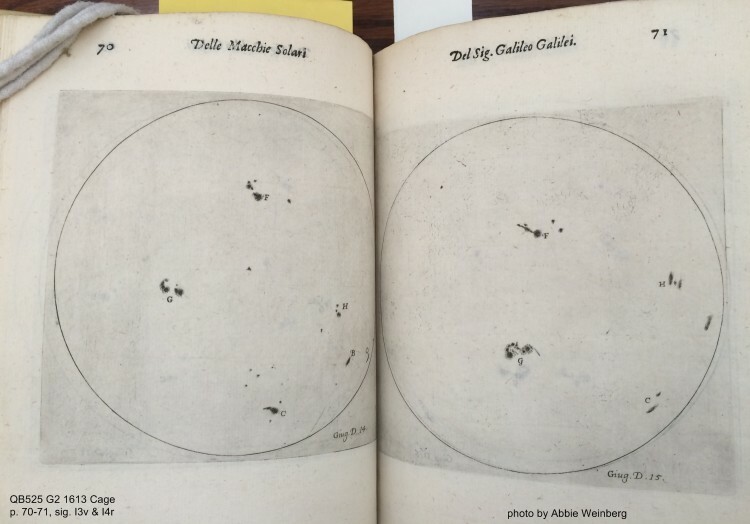 Left, continental chronological file for 1586-1590; right, continental publication place file, M-O. In the same way that a paper at a conference, or a discussion over tea, can spark new ideas for research, these different access points to our collection, along with the digital ones provided by Hamnet, can be critical for scholars, as they try to examine all aspects of a topic, or find connections between ideas. While I am all for the ease of access and searching that digital catalog records provide, I believe that the greater the variety of access points we can provide to our collections, the better we serve those using our collections. Have you ever had a moment where the way you accessed a collection helped spark an idea or draw a connection you might not otherwise have found? Share it in the comments here! a term which, according to the OED, post-dates “card catalog” by about 50 years! For more information about this work, and to see these images animated, please see Rice University’s Galileo Project. I say “most” because, as mentioned above, we stopped adding cards in the late 1990s. Therefore, if we’ve added a book since then, it will ONLY appear in Hamnet. Still, these card files will probably get you 90% of the way there. Nadia Seiler would have loved this article! In fact, we discussed the value of card catalogs back when she was first getting into libraries as a summer job at Harvard’s Widener library…Thank you, Abbie for this vigorous defense of the wayward thinking induced by the old, tangible system! If an entry on that list isn’t linked, it isn’t in Hamnet yet, and scholars need to use the card catalog to find it! Such a useful post–and reminder–Abbie! Thank you for this. I guess I’m as old-school as they come about the importance of open-stack libraries, hands-on non-virtual perception of the way and authors are organized in a catalogue, and even (for this old dog) of taking notes in the reading room by hand in a notebook before transcribing them to a computer. So true! I was happy to read this article giving credit to the card catalogue. Fifteen or so years ago there was a fascinating article in The New Yorker on what was being lost when the card catalogues were being phased out. I have recognized their importance ever since.